Home » The Lady Varnishes Come Back To Me & Don’t Dream It. Be It. The Lady Varnishes Come Back To Me & Don’t Dream It. Be It. Hey dolls! Today I have a review for you of an indie brand that I think deserves way more attention in the blogosphere. I recently tried The Lady Varnishes during her Black Friday sale and she’s been on my radar ever since. Each one I’ve tried has an amazing formula and applies flawlessly. The polish is thick, but in a good way where its easy to manage, well pigmented, and self levels nicely. The Lady Varnishes Come Back To Me is described as a shimmery pink-beige varnish with gold, pink and aqua hexes. I absolutely love this polish. The mix of glitters and shimmer is so pretty. It’s soft, yet makes a statement. Two coats were used below. The Lady Varnishes Don’t Dream It. Be It. is described as an aqua varnish with gold, black and blue flecks and blue microglitter. The glass flecks are amazing in this polish! Two easy coats were used for opacity. I actually wore both of these polishes for several days, which doesn’t always happen when I’m reviewing polishes. I have one other color changer from The Lady Varnishes to post soon. I wore it, but I wasn’t pleased with my pictures. I’m so thankful to one of my polish besties, Tamala, for introducing me to this brand last year. 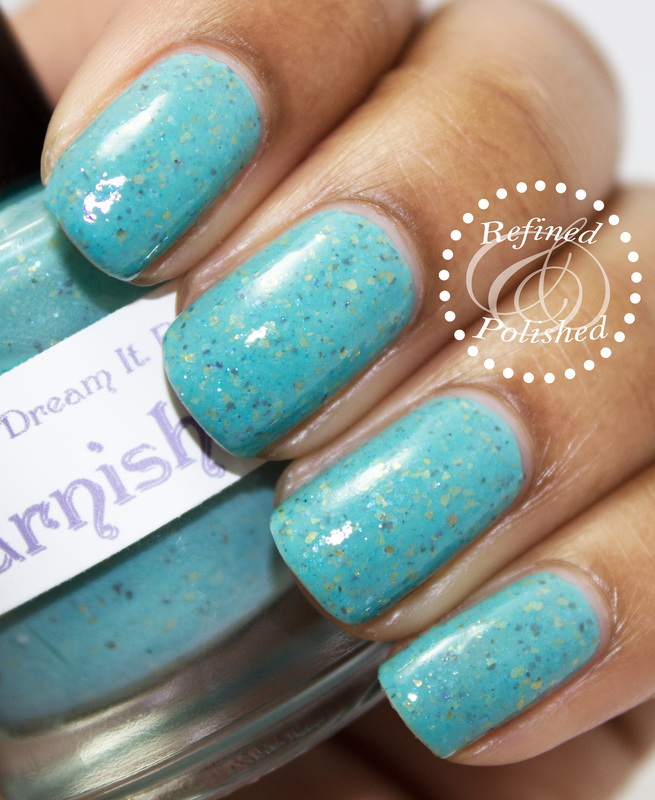 The Lady Varnishes polishes can be purchased on her website or Etsy shop for $9-12 each. Keep up with them on Facebook for new releases and deals!